The last day of March.......one quarter of 2014 is gone and no way to bring it back. Life is short and getting shorter and time is moving so fast it leaves me breathless. The future that I always thought would be here tomorrow is now.........I thought at first when treatments began that it was ok to lose a few days each month.......but it's going on three years and suddenly those few days each month are adding up.......and I realize, it's not ok. Even the bad days have to be good, even when you don't feel well those days have to count.....days cannot be lost......cannot be tossed aside. Every day is valuable, every day matters. One day, every day will be your last day.....that's why they all count, every day matters. This weekend was two days of diamonds.......they can't all be diamonds, but when they are not.....they won't be stones.....some will be golden, while some will have no shine or sparkle.....but they will all have value.....and I pray I am smart enough to cherish them all. 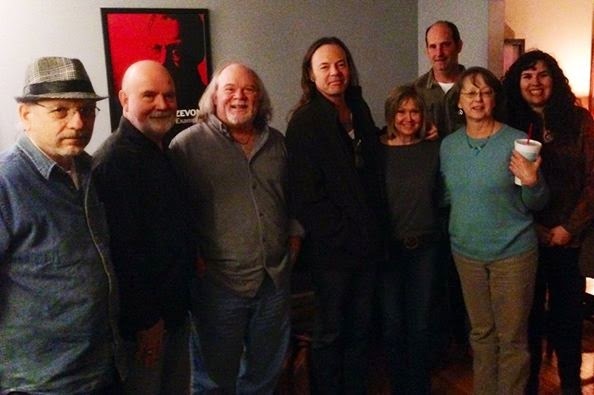 Wanted to share the photo of the songwriters who were at the workshop last night. I am standing by Kevin Welch, one of my songwriting heroes. It was an incredible opportunity to spend time with him and pick his brain......and then, to get to hear him sing his songs. In case you don't know who I am, I am the shortest person in the picture. I have had a wonderful weekend, our gig was awesome today. If some days are diamonds....then I had the Hope Diamond over the weekend. Wishing you all a week that is easy and smooth......March is leaving, April's arriving. It has been truly been a night to refresh and recharge......we visited our friends home in Birmingham tonight for a songwriter's workshop and concert with Kevin Welch. Rick and I have been to many songwriter workshops through the years with some great writers......but this one was absolutely one of the best. If you have never heard Kevin and his songs, do yourself a favor and listen......he is a songwriter's hero. I needed this night, to be with other musicians, to learn and to listen. I am inspired, encouraged and excited.......it is so easy to find a nice comfy rut and stay there. tonight was all of that. Once again I encourage you all.......if it has been a while since you have refreshed and recharged......do it soon. There are too many of us on automated pilot, that are going through the motions. Life is short......that bears repeating.....life is short. Today several of my students talked about how yoga had helped them the past few weeks.....one talked about how much her flexibility had increased......one talked about how much better his nights were and the quality of his sleep.....another talked about how much calmer and peaceful he felt........I was not surprised. People are often surprised that yoga helps them in ways that previous exercise classes did not. I explain to them that I don't teach yoga as an exercise class, but as a mind body experience.....heavy on breath work and relaxation. I explain that no matter what your beliefs are, the stillness and inward journey that yoga takes you on can strengthen those beliefs. I believe that yoga is healing.......with the breath work and relaxation......healing for the mind, body and soul can begin to take place. Classes were good for me today as well.......sometimes the teacher needs the class as much or more than the students. I tell my students often, that their participation in class gives me way more than I give to them. Wishes for a good weekend for all of you, we have storms coming at us tonight, but maybe a clearing by noon tomorrow. Be kind to yourself this weekend.....that kindness will spill over to others. Waves of pollen blew through the air today........even temps in the twenties cannot stop spring time pollen in Alabama. The persistence of the changing of the seasons is interesting.... days are longer, trees and plants are refusing to surrender to the cold temps. I try to find inspiration daily in the abundance of good things in mother nature around me. To see the strength of young new leafy buds, the shock of daffodils golden gleam, and the richness of the purple wild violets as they push their way through inches of dead leaves always gives me hope. I figure if those tiny fragile plants can survive and thrive......so can I.
and the blessing of hearing a child giggle. Hanging out today, just enjoying the simple pleasure of doing nothing in particular. My post last night was a special message to me and I took it to heart. Sometimes the words you write appear just for you. It was very cold last night, down in the twenties, and I am concerned about our fruit trees.....the peach and pear trees are blooming.....it has been two years since we have had a decent crop of fruit....hoping this year will be a banner year. It's hard to farm and play the hand of mother nature, she is so fickle. Hump day is almost over.....so is March.....just a few more days and April will be hanging on the kitchen wall. There is a picture that sits on my desk of me and two of my dearest friends......on the frame are the words, refresh and recharge. I look at that picture each night as I write this blog, it has been there for a long time.......yet tonight is the first time ever, those words spoke to me. Refresh and recharge.......I rest each month after treatment, but how long has it been.....refresh and recharge. I think about refresh......how everything feels when it is fresh, the vitality, the energy that is there when something is fresh. Recharge......notice how your cell phone fizzles out when it's time to recharge, how anything slows down when it's batteries are low. So now I'm thinking, what would refresh me, how can I recharge? And just as I am sitting here writing this blog, Rick tells me about a concert/songwriter's workshop we have been invited to attend. I think being in a room full of musicians with a world class songwriter......that should recharge and refresh just a wee bit. Isn't that how it goes, what we need is right there in our face, waiting for us to claim what is ours. This weekend, I will refresh and recharge.....what about you? When's the last time you refreshed and recharged? Thanks for your kind comments and birthday wishes last night. Years ago I would have been disappointed with a quiet family birthday, but at this point in my life it was perfect. It has been a hectic day, Jordan, our six year old great nephew spent the day with us......he and Rick had way too much fun.....well, I had a lot of fun too. Even though I was exhausted by the time I went to work this afternoon, it was ok......a fun day with Jordan is worth any amount of fatigue. I hope that this week brings sunshine, words of encouragement, and laughter.....I also hope that each of you in some way, know that you are loved. Today I celebrated my birthday......sixty-two years......I cannot believe all the cards, calls, messages that I have received. If ever I doubted that I was loved, today has proved that I am. My sister Pat, and her daughter Jayna cooked lunch for me today, it was wonderful. It has been a beautiful restful day. We walked the dogs, took a nap, and had lunch......it might not be the most exciting birthday, but it was one of those I will remember. I always miss my dad so very much on my birthdays. He loved to make a big deal about birthdays, and he always wanted to be the very first to wish you Happy Birthday. I can't tell you how many times he called me at 6:00 am to sing Happy Birthday. If I could just hear him sing one more time......and get one of his funny crazy cards. Sixty-two years......a long time, a blink of an eye......a life that has been blessed with friends and family. I am a lucky woman......I am a blessed woman. 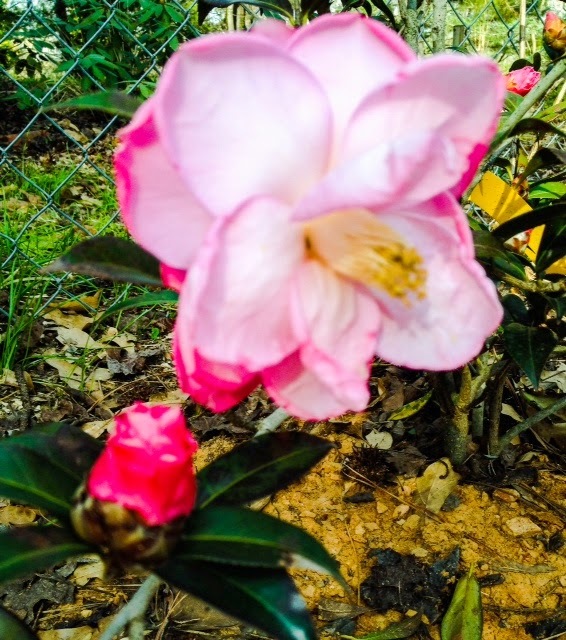 Our friends Kaye and Jamie gave us this beautiful camellia for Christmas. She was covered in buds.....she has since been through three snows and faced temperatures of five degrees with below zero wind-chills. I honestly thought there would be no blooms......what a surprise. The past couple of sunny days gave life to her wilted buds and she blossomed. I love receiving plants as gifts. They are daily reminders of the ones who gave them.....they are daily reminders of love. I hope your Saturday included something beautiful, a giggle or two, and a hug. Faith and hope.......I have kept these words in my brain for the past few days. I have friends who are going through very trying times in their lives, and for them, I keep hope and faith that all will be well. I think sometimes it is easier to embrace those two words for others than for ourselves. At times during the past two and half years of monthly treatments, faith and hope have sometimes hidden themselves from me.....but I know my friends and family have kept them for me. That's important you know, when the chips are down and you might not have hope or faith in your life, that others who love you do. I believe with all my heart that your faith and hope for someone else can help them......if nothing else, it reminds them of how much they are loved. Faith and hope.....such small words.....such powerful words. If they have become lost in your vocabulary or they no longer live in your heart......I bet there are those around you who are keeping them for you.....and one day, you'll find them again. Spring did visit Alabama today......clear azure skies.......warm sun.....60 degrees. I hear she might leave for a few days next week, winter doesn't want to leave us. Spring is being so fickle this year, what do we have to do for you to stay? All I can say......Welcome Spring, we hope you stay a while. Winter has truly outstayed her welcome. A really good day off.......we went over to our friend Joe Greg's house around 10:00 this morning. He's been down in the dumps the past week or so......he's a guitar player and singer/songwriter.......about a week ago, he was doing a handy-man project at home, and had a close encounter with a saw. We are all holding our breath, hoping that he will again play the guitar in the coming months. This morning, we wrote. ( I cant believe I had a hand in this) called Gone Fishing. It was just the thing to lift his spirits. We had a great time, and the songs are really good. I needed this day also.......still not feeling so good.....work has been a wee bit difficult.....you know how life goes sometimes. There is nothing like creative juices flowing like a river to make you feel better. Birthing a song has to be akin to birthing a child.......not the actual pain, well sometimes that kind of pain is the root for a song. But there is an intimacy that is shared with your writing partners, a camaraderie that no one else will understand until they too have shared their thoughts so openly. So, two new songs, seeing a friend who was down, smile.......it was a good day. Some days you just have to step back and think things over......I have been doing that for several days now. There have been few times in my life when I have given serious thought to what I want. Most times my decisions have weighed heavily on what those around me, wanted or needed. Health issues, life changes, age......so many things come into play at various times in our lives. A decision we made at 25 would probably be quite different at age 45, same goes for one made at 50 or 60. Needs and wants change with our lives, what was once important may cease to be, and the mundane may become high priority. reassessed and lives viewed totally different. When you make the decision to live life to its fullest, to be healthy, to take care of you and let go of old wounds and hurts......a breath of fresh air sweeps into your life. Several of my students will say goodbye to me this week.......they leave the center to go start life over, to pick up pieces, to mend fences, to make new starts. They are scared and excited.....because they have possibilities. I too, am scared for them and excited......some will go forth and truly live again.....others will not......some will be killed by their disease of addiction. If they only knew, how many prayers I have said for them, how much love I send with them......but in the end.....their choices, their decisions are the paths they go down....just like all of us. Both my sisters came to visit this afternoon, Pat and Nell.....we laughed so much my body hurt. My birthday is next Sunday and Nell wanted to bring my gifts up today, so Pat came with her. Great gifts......trees! Well, to be exact......a plum tree, a hawthorn tree, and English walnut tree, an orchard tree (it bears three kinds of fruit, apples, peaches, pears) and a blackberry bush. It was a beautiful afternoon, and as soon as they left, Rick planted everything. I can't wait to see them all grow......I can't wait for the crops. My sisters are quite a bit older than me and I am sure at times they probably wanted to give me away when I was little. Nell married when I was around 5, her daughter Myra is just five years younger than me. Pat is 9 years older, and every time she ever had a date, I cried to go with her. I think I had a crush on every boy she ever dated. One of the nice things about getting older, the three of us have become good friends. I believe that having sisters helped me to appreciate the friendships of women, to know the value of other women and how their friendships add so much to life. My sisters are strong, smart women. They had careers, raised families, lived through divorce and deaths of spouses and are still vibrant, and full of life. I look at them and realize how lucky for me, that these two are my sisters. Every time I count my blessings, I include my sisters. The two of them helped to shape my life as much as my mom. I can't imagine my life without them. They say that when blues legend Robert Johnson came to the crossroads he sold his soul......at one time or another we will all come to the crossroads, some will sell their souls, others will take the road less traveled and the rest will not stray from the road they have been on forever. Songs have been written about the crossroads, movies have been made about the crossroads.....the crossroads is a scary place. It is that point in our lives where everything can change, depending on the direction we take. We may reach several crossroads in our lives, some more significant than others, but I promise sooner or later, we all reach the crossroads. In the coming months I will face the crossroads.....the past few days I have wrestled with the thoughts of that event. I know that that at this stage of my life, there probably will not be that many more crossroads. I want to take the right direction. Some come to the crossroads without much thought and breeze right through.......and I admit, I have done that in the past. But this time, I want the road that is right for me, I want the road that takes me to the place where I can shine, where my light will be its brightest ever. Day 2 after treatment.....not so fatigued today, still some chills and fever, and only one wave of nausea.....a good day. It was a beautiful spring day here in Alabama, blue skies, a little windy and cool, but color is beginning to burst forth. Tiny touches of green on tree branches, blossoms on fruit trees and yes there is pollen in the air.......and lots of rain for the next two days. It's ok, this is my weekend of couch time. I meant to take a walk today, but that didn't happen, maybe tomorrow. I had to remind myself it's Friday, I have lost track of time. Wishing you all a good weekend, I hope you get a glimpse of the sun and feel its warmth, I hope you giggle like a three year old, but most of all......I hope someone hugs you. There is a posture I teach in yoga called five point star.......usually when I teach it, I start by explaining that I understand the feeling of being invisible.....I then discuss claiming your space. When you are in five point star, you stand in a wide stance with arms up and out with fingers spread.....your head, arms and legs form that star. I talk about not hiding in the shadows when you feel small and invisible, but to remember that five point star. Claim your space in life and shine like those stars in the heavens. Every time I teach that pose, I see people smile as they claim their space. There is nothing worse than feeling invisible, that sensation of living in the shadows.....if you feel that way long enough, all sense of confidence disappears and with it, all sense of worth. and if need be.......take a stance in five point star and take five deep breaths. Remind yourself of your accomplishments, no matter what they are, how big or how small......and refuse to allow anyone to let you feel that way. We are all stars that light up the universe, we each have our space.....don't let anyone take it away. #27.... it is becoming a blur, and the time between each treatment shrinks. I am not brave, I am not strong.....I am doing what it takes to live my life, because I love it so much. Those green chairs feel like home, no longer intimidating, no longer scary......just a part of my life. The nurses are old friends now, we know each other, our lives have meshed......strange as it might seem, I look forward to seeing them. Louis, my chair buddy and partner in crime, was there today. After his health scare last month, seeing his face today was a joyful occasion. He looked so good, so much healthier than last time. This evening has been restful, tomorrow will be a couch day. Yesterday it was 75 degrees, tonight it is already in the 30's......maybe a walk, a short walk to the barn tomorrow. How can lying in a big green chair be so exhausting? How can the clear jelly be so good for you, yet make you feel so bad? Wednesday night, hump day.......wishing you all the sweetest of dreams, may the rest of your week be as easy and smooth as a big spoon of honey. Classes today were about choices, the lesson.....we are where we are because of our choices. Understanding that can be frightening.......it can also mean freedom, because if our choices got us here and we don't like our path......we can make new and different choices. I think about choices that I have made during my life, some good, some bad.....and when I think about where I am now......I have to agree, my choices got me here. As I watched my students faces today and we talked about choices......it was obvious some serious thoughts were taking place. Being in an addiction center, thinking about the choices that you have made is a sobering thought......but the bright side, new choices can bring about a new life. We make choices all day, about how we spend our time, what we eat, where we go, who we see......most we make without much thought. But what if we truly began to think about our choices, even the simple ones.......like fast food or something healthy......getting angry in traffic or seeing it as a gift to slow down a little..... watching tv or taking a walk.....ignoring the beauty around us or beginning to look at the little things, such as tiny blades of green grass appearing, buds on tree branches or a clear blue sky. I admit, most days I too function on automatic but I am trying harder to make better choices, trying harder to think about my choices and their consequences. We are our choices, we live by them.....we die by them.....and our choices affect all who are around us. I taught classes today and tonight on back and hips.......I hear complaints so often, from young and old about their backs and hips. It was a good class, but teaching the same class back to back is exhausting. Treatment is Wednesday, but my sister's best friend, who is like another older sister to me, gave me a beautiful turquoise blanket for birthday. It will brighten up my day Wednesday, I love having a soft fluffy blanket to wrap myself in. My birthday is not until the 23 of this month, but Asa (my sister's friend) wanted me to have it for treatment. I am so humbled by the kindness of people around me. It is a beautiful clear starry night, but rain is moving back in tomorrow. I did spend a few minutes on the deck before going to work this afternoon, the warm sun was magic for my body and spirit. Here's hoping that tomorrow will bring laughter, hugs and joy to all of you. Treatment week......it just seems like I had one last week. We had a fire in the firepit today, our musical think tank met at our house, there was music, hot dogs, good friends and laughter. It has been a good weekend......I cleaned house, did laundry and bought groceries. A nice ordinary weekend. and may a ray of sun touch each of you. A spring forward tonight, daylight lasts longer in the spring and summer anyway.......how come we spring forward? and why don't we spring forward on the actual first day of spring and fall back on the first day of fall? Wouldn't that be simpler if we are going to manipulate time? This Daylight Savings Time seems a perfectly good waste of government time and work......how many hours and days were spent to pass the bill, how many more important issues were passed over? Just curious about this stuff. I admire the states that did not adopt it. So what will you do with all your extra day light hours? Do you spend more time outdoors? It's interesting to hear friends and family talk about the longer days, but I'm not sure how much extra time we spend outdoors. For me, the toughest thing about Daylight Savings is the fact that the mornings are darker and it is harder for me to get going. About the time, my body gets use to the change, it's time to switch again. I have often wondered what it would be like to live a life without recording time......no clocks, no calendars......just to live each day as it unfolds, work while it is daylight, sleep when it is dark. My grandparents lived that way.....when I was a kid I thought they were crazy, to go to bed at sundown and get up at sunset......but now and then, it seems like a really good idea. So, I find myself looking at the clock tonight......I go to bed my normal time, yet it is an hour later.....do we ever truly get back that hour we lost? All these time thoughts have made me dizzy, and probably you too. 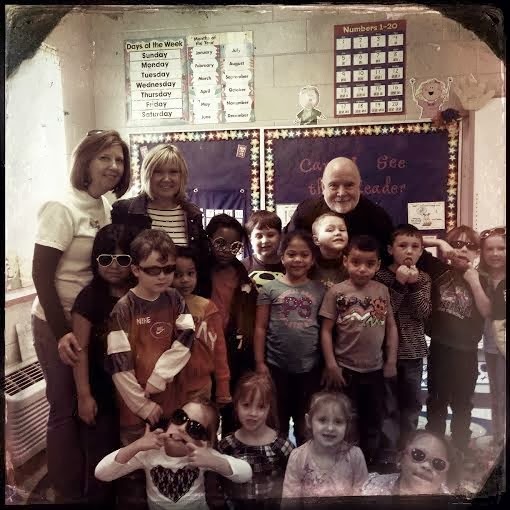 Jordan's kindergarten class invited us to read to them today. We read one of my personal favorite children's books, Joshua and Bigtooth by Alabama author, Mark Childress. It is a fun story about a little boy who catches a baby alligator and names him Bigtooth. Of course, we also took the guitar and did a song, Jambalaya by Hank Williams. And I taught the kids how to shimmy dance the way alligators do. It was a delightful day. If you ever get to spend time with kindergartners, I urge you to do so.......I promise, you will not be bored. Tonight my body is spent, my mind is running on empty....it is time for rest and renewal. I wish you all a good night and sweet dreams.......may your Friday be smooth and easy, and remember to laugh out loud. If given the opportunity to spread kindness....be generous. eulogy for Dennis. Even the music was so Dennis.....Free Bird.....it made me smile when I heard it. We finally had sunshine today, though rain is moving back in tonight. Those few hours of blue skies and warm rays were magical. A friend shared Frederick Buechnor's thoughts on Lent with today on FB. His words were some of the most interesting and profound that I have read concerning Lent. I wanted to share them with you tonight. My cousin Dennis passed away suddenly Saturday.......his funeral is tomorrow. His dad and mine were brothers. My dad's family was small, he and two brothers. Both his brothers and their families lived by his parents......I have thought so much about my visit to their houses. When we would visit Mamie and Johnnie ( daddy's parents) I always went to both uncle's houses to visit my cousins. I remember Uncle Cecil and Aunt Mary ( Dennis' parents ) and Uncle James and Aunt Inez so well. I remember their Christmas trees, foods that they cooked, all the time that we cousins played together. None of us had much, our homes were very small and modest, but there was no doubt that we were loved. Our families were small to start with, they are even smaller now.......Dennis' sister Carolyn is the only sibling left in his family. James Ray and Jerry are the only sons of James and Inez and then there is my sister Pat, my brother Ricky and me. My mother's family was larger, but now even most of them are gone. It is sad to think of family gatherings and realize that more are gone than are here. But, that is life. My cousin Carolyn made the remark that grief was really more self-pity for us now, because yes, we are sad, but we also feel sorry for ourselves and the loneliness of missing our families. I think that is true......I looked around tonight and realized how quickly time had passed, and how it seemed we all had aged overnight.......Carolyn was right, I do feel a great deal of self-pity tonight, I miss my parents and grandparents and aunts and uncles and cousins. "You have brains in your head. You have feet in your shoes. You can steer yourself any direction you choose. And you know what you know. And YOU are the one who'll decide where to go." March 1......robins have arrived, daffodils are blooming, tiny leaf buds are appearing on the oaks and hickories.